There seems to be some level of confusion among email marketers as to the importance of the preheader. Both newcomers and old hands in the field are scratching their heads over the impact of an element of email which had been largely ignored from the dawn of email. Many classic email clients simply did not display the preheader so it was not considered at the top of most email marketing strategies. That all changed once the mobile revolution placed a great deal of emphasis on the preheader as a key factor in getting your customer to open the email. Effective preheaders increase response rates, so these basic tips will help you write the best preheaders possible. Be imaginative – In many cases the preheader is your primary shot to capture the reader’s interest, so you should write it in such a way that it stands out from the competition which is cluttering the inbox. What you are trying to do in composing a preheader is to lure the prospect into clicking the open button, so anything that you can legitimately and ethically write into the preheader is fair game. Enhance the subject line – The preheader should not duplicate the subject line but enhance it. Consider the preheader as a tease of the email content and a middle phase in the determination of your customer to take an action. First they read the subject line; that interests them enough to read the preheader; and that drives them to open and read the email. Condense the phrases – Different email clients and mobile devices display preheaders in different ways. Gmail, for example, cuts off the combined subject line and preheader at a very short 100 characters. You can’t go wrong in any email client’s display by condensing your preheader to a couple of effective phrases. Mind the style – To help the customer spot and read your preheader it should be of high contrast to the background, so very dark type on light background or vice versa is the best approach. It is customary to set the preheader in slightly smaller type than the text content of the email, but it’s not recommended to drop it below 8 points. Call to action – You should never include this in your subject line, but a curt and concise call to action can make for a powerful preheader. 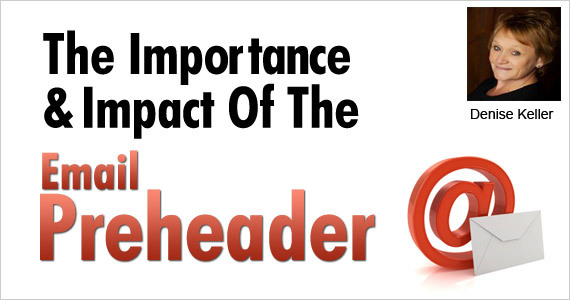 The best preheaders entice and draw in your readers so don’t just cut to the chase. Consider tempting your reader with the value to be found within the email and charm them to the point where they can’t resist opening it. Keep testing – Testing is the heart and soul of email marketing so it follows that such an important element as the preheader should be subjected to intensive A/B split testing. The more involved Taguchi multivariate testing is very effective in determining the success rate of various combinations of factors, and is well suited for testing preheaders as they relate to the other email elements. Conducting extensive testing of your preheaders and the other elements which make up your email will allow you to keep improving your open and click-through rates. A preheader is an overview onto your entire email and it should captivate your customer into reading your content. A solid recommendation is to invest time and effort into writing the best preheaders you can. Profile: Denise Keller is COO and founding partner of Benchmark Email, one of the world's leading email marketing services for small businesses. Keller served as Vice President of Finance for restaurant chain Market Broiler and CEO of Accor's Ticket Services Division before transferring into the COO position at Benchmark, where she has been instrumental in bringing in numerous small business customers, as well as high-profile clients that include Mercedes Benz, Siemens, and Kaiser Permanente. Great Tips!!! Thank you Denise. 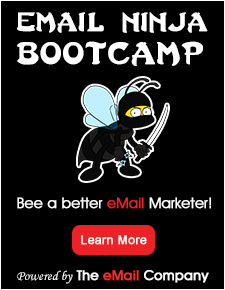 This is a great learning and implementable tips for an email marketer to achieve it’s primary goal. Thanks for the advice Denise. I think it’s an oft neglected part of an email so nice to draw attention back to it and reconfirm its value. I couldn’t agree with you more. Funny thing, I have never played around with the pre-header of our newsletter. Going to start!!! Thanks for the nudge. Also appreciate you joining the blog team! Welcome aboard and we look forward to more great posts from your side.